Bed & Board is the fourth installment in François Truffaut's series of films about the lovable rogue Antoine Doinel (Jean-Pierre Léaud). The previous film, 1968's Stolen Kisses, ended with Antoine settling down after some romantic adventures, finally realizing that his longtime on-again-off-again girlfriend Christine (Claude Jade) was the girl for him. This film opens with Antoine and Christine married, living in a small apartment above where Antoine works in a shop dying flowers. The film's opening scenes follow Christine on her errands, initially only tracking her shapely legs below the hem of her skirt, as she goes from shop to shop, correcting the shopowners on her title: she's a "madame," not a "mademoiselle," she says proudly, perhaps proud both that she's married and that she looks young enough to still be mistaken for a young unmarried girl. When Christine returns home soon after, she runs into an old man on the staircase, who lets her go ahead of him so he can ogle her legs, the same way Truffaut's camera had been admiring them just moments before. The point is obvious: Antoine has a young and very desirable wife, and in the subsequent scenes some comic interplay with a slightly older woman who flirts with Antoine establishes that he too is young and desirable. It's a portrait of a happy marriage but already the emphasis on youth and attractiveness sets the stage for some straying outside of this marital and domestic bliss. The film picks up where the previous Doinel films left off, continuing to examine Antoine as he grows up but doesn't exactly mature. The series that started with Antoine as a young boy, rebelling against his parents and the oppressive confines of school, has now followed him through his teenage romantic troubles and into adulthood and marriage. The previous films are very much present here, in ways both obvious and subtle. During the early scenes, when Antoine is working at the flower shop, he gets a call and answers the phone with an enthusiastic greeting to someone he greets as a mother; for a moment, one wonders if Antoine has at last reconciled with his parents, who were last seen in the first film of the series, The 400 Blows, before he ran away from home. Instead, the woman on the phone turns out to be Christine's mother. As Antoine says, "I don't fall in love with a girl, I fall in love with her whole family." This was a running theme of the earlier films in the series as well. Antoine, who had such an unhappy childhood and such lousy parents, is constantly looking for an adoptive family to call his own. In Antoine and Colette, he'd been as attracted to Colette's loving, kind parents as to the girl herself, and in fact he'd probably spent more time with her parents than with her, as she was constantly dodging him and keeping him at a distance. In Stolen Kisses, he'd formed a similar dynamic with Christine and her parents, and his love for Christine seems to be bound up in his admiration for the happy home life and close relationship she has with her parents, a domestic contentment that had been denied to Antoine (and, by extension, Truffaut) as a boy. Later, Christine refers to Antoine's ill-fated relationship with Colette, thinking that his admiration for Christine's new glasses is linked to the girl he once loved as a younger man. He corrects her, saying that Colette didn't wear glasses, but in fact his desire for Christine to keep the glasses on in bed hints at something else altogether: a slight restlessness, a desire for something a little different, for a change of pace. Antoine has met a girl, the Japanese girl Kyoko (Hiroko Berghauer), and he seems to be heading towards an affair. That's the drama that eventually emerges from the film, but it does so only slowly, gradually bubbling up from beneath the light, charming surface of everyday life. Léaud is such a charming presence that he's fun to watch no matter what the context, and the same goes for Jade. But the sad fact is that each subsequent Antoine Doinel film seems less weighty, less substantial than the last. By this point, the series has become a venue for Truffaut's lightly comic musings on marriage, which are strictly generic and derived from conventional romantic comedy — the best example is the recurring and very unfunny routine with an impatient opera singer and his perpetually late wife, who's always scurrying after him. When that gag is repeated by Antoine and Christine at the end of the film, it's meant to signify that they too have fallen into the routines of marriage, that this is true love. Instead, it's merely sad to see these charming and lively characters subsumed by such lame material. Truffaut's comedic impulses are at the level of a sitcom or a tired old-school comedy, with overly broad caricatured characters: dirty old men, horny housewives, and so on. In comparison to the loose, rich, offhanded humor of The 400 Blows and Antoine and Colette — humor that emerged organically from the characters and situations, blended into the varied emotional palette of those films — this staid and prosaic comedic sensibility is a jarring disappointment. Still, there are a few good recurring characters, especially a friend of Antoine's who's constantly asking to borrow money in incrementally greater amounts, always asking to borrow again whatever he already owes. Truffaut also makes good use of a sinister mystery man (an echo of the mysterious stranger who followed Christine around in Stolen Kisses) who everyone in the neighborhood calls "the strangler." The man turns out to be an innocuous actor, and one night Antoine and Christine see him on TV, doing impersonations of Delphine Seyrig. He starts out performing a parody of Resnais' Last Night In Marienbad, then segues into dialogue from Stolen Kisses, dialogue that Seyrig's older seductress had spoken to Antoine before they went to bed together. As the lines are spoken, Truffaut focuses on a closeup of Christine, smiling and giggling, oblivious to the fact that the actor is reciting lines from one of her husband's previous sexual adventures. It's another of the film's premonitions of the marital discord and infidelity to come. The thing is, once Antoine has achieved the bourgeois family life he always wanted — the loving parents, the sweet and smart wife, the beautiful baby boy they have halfway through the film — he doesn't really know what to do with it all. He's still a playful and aimless young man, drifting through life. He gets fired from his job as a flower-dyer after screwing up a bouquet with an experiment that fries the flowers, and he stumbles through a case of mistaken identity into a new and even more whimsical job where his sole responsibility seems to be piloting remote-controlled boats around a lake-sized scale model of a harbor. The purpose of this bizarre job is never explained; it's merely a sign of Antoine's continued existence within a quasi-adulthood in which he hasn't quite adopted to marriage, or parenthood, or the responsibilities of a real adult job. As little as Bed & Board resembles the earlier films in the series in terms of tone or style, Antoine himself is still very much recognizable, the impish adolescent of the earliest films in the series still embodied within an older body. Antoine's continuing uncertainty about what exactly he wants leads to one of the film's best sequences, the penultimate scene at a restaurant where Antoine goes with Kyoko. During the dinner, in between courses, he keeps leaving the table to call Christine on the phone, telling her how unhappy he is and how tired he's grown of Kyoko already. The calls eventually lead to his reconciliation with Christine, a very touching moment in which Truffaut cuts back and forth between closeups of the earnest, upset Antoine and the sweetly smiling Christine, the editing bringing the couple back together even though they remain separated across the phone line. It's a very touching moment, and even if Bed & Board on the whole is too weak and inconsistent to be considered a truly worthy successor to the earlier films in the series, moments like this carry over a measure of the emotional complexity and warmth most closely associated with Antoine Doinel and his adventures. 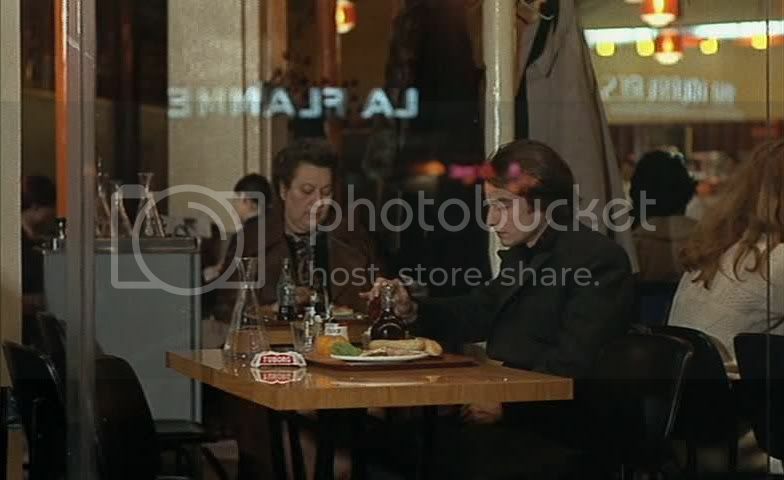 That's Helen Scott (Truffaut's collaborator on his Hitchcock book) sitting near Leaud in that still.